When you offer services, there’s a lot of different ways to package your brilliance and sell it. While the idea of packages are nothing new, how exactly you create your profitable package can make all the difference. The right package in your business can be a game changer as you go from trying to articulate what it is you do to being able to sell your services with confidence. Instead of having to talk through everything involved as part of a sales conversation, you’ve got an informed potential client who knows what you offer and how you can work together. Think of it this way, when you’re selling your services, you want your prospective clients to be as ready to buy as possible. By outlining what you do, how you do it, and what their investment is, you’re able to spend your time on would-be clients that are better qualified. Instead of getting on the phone to talk to someone who needs to be convinced, you’ve got someone who’s already 80% of the way to making a decision. Now that you get why you need a package, let’s talk about exactly how to create a package for your services. When you’re creating a package, you want to spend a lot of time upfront getting clear on what exactly it is you offer. A package isn’t something you put together as needed for potential clients but something you have planned out and feel committed to offering. When you’re first creating a package, the best way to define what you offer is to pay attention to what things you’re currently doing on a repetitive basis for clients or to look for things that potential clients ask you for time and time again. For example, if you do a lot of hourly writing of email content for your clients, you have the perfect opportunity to create an email package. By creating a package, you’re able to better define the deliverables for clients and potentially charge more for your services. A package isn’t about offering everything and the kitchen sink. For a package to actually be profitable, you want to ensure that it locks down on a specific set of services and is ideally something you can systematize. As you create your package, challenge yourself to not just determine who it’s for but who it’s not for. That way you’ll be in a position to ensure that you’re working with clients who are a great fit and will respect the limitations of your package. Finally, design your package in a way that’s easy for potential clients to understand. Remember, a confused mind doesn’t buy, so simplicity is key for your package. Here’s what you don’t want to do when you’re creating a profitable package: simply slap something together because you think it’s what people want. Packages shouldn’t be created without first researching or testing them. If you’re new to offering packages, I recommend starting with some market research to understand the need for your package in the market. This could be done by talking to your ideal clients, surveying your audience, or even doing competitive research. You want to validate that this package is something that there’s an actual need for. Once you’ve conceptualized the package and done your research — but before you get too attached to it — commit to testing it. Work with a handful of clients in this package to learn where you can improve it, what you may not have considered, or what clients want more of. Plus, this will help you validate your idea, as once you’ve worked with a few clients, you know this is something that people will pay you for. Packaging your services isn’t something that can be done quickly, so keep yourself open to the process so you have a package that your clients really want. Pay careful attention to what you’re learning in the testing phase as people go through your package. Based on their feedback, you can then refine your package. For example, when we first started offering blogging packages, we spent multiple months figuring out how to make the process more efficient for clients and how to price this service package in a way that was appealing to clients and profitable for the business. Refining your package may happen over the course of weeks or even months, but this feedback loop ensures that you’re creating a package that can be profitable for your business and delivers real value to your clients. For each package you create, you’ll want to rinse and repeat the above steps each time. It may seem easier to simply slap something together, and get it out there, but trust me when I tell you that you don’t just want to offer a package; you want to offer a package that helps get you paid. 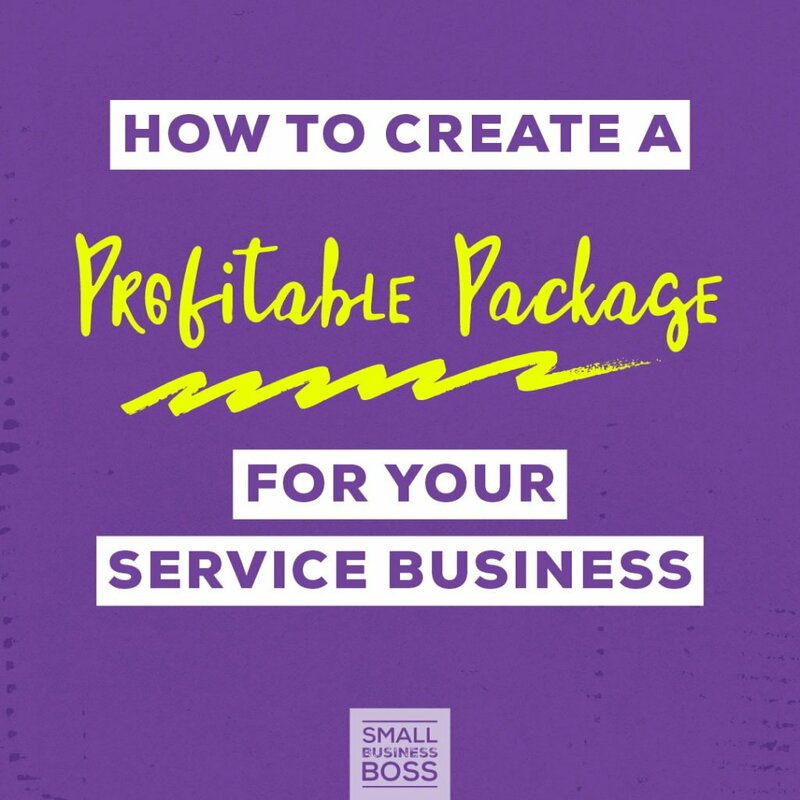 Speaking of which, if you want help creating your profitable package (or signature service), you’ll want to check out this brand new workbook I created for you.